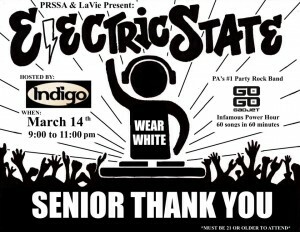 DETAILS FOR PRSSA and LaVie present, Electric State: Senior Thank You! PRSSA and LaVie present, Electric State: Senior Thank You! Comments Off on PRSSA and LaVie present, Electric State: Senior Thank You! The Public Relations Student Society of America and LaVie, the Penn State Yearbook, are presenting Electric State: Senior Thank You on March 14, 2012 at 9 p.m. PRSSA and LaVie will be honoring seniors with various giveaways and prizes throughout this battle of the D.J.’s event, which will take place at Indigo, 112 W. College Ave.
Penn State’s finest student D.J.’s will battle to win over the crowd, and to earn bragging rights. The D.J’s will open for Go Go Gadjet, a cover band that is a weekly staple at Indigo on Wednesday nights. The event is open to all persons 21 years and older. Cover charge for attendees will be $4.00. Electric State will feature the rising dance genres, “dubstep” and “house” music, in addition to the Top 40 hits. The event will be high energy, and will be decorated in a “neon highlighter” theme.